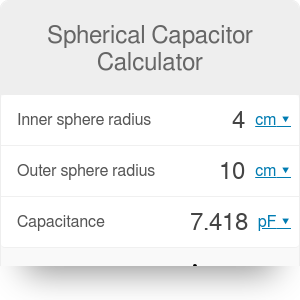 This spherical capacitor calculator will help you to find optimal parameters to design a spherical capacitor with a specific capacitance. Unlike in the most common parallel-plate capacitor, spherical capacitors consist of two concentric spherical conducting shells separated by dielectric. Read on to learn about the capacitors, the spherical capacitor equation, and about two combinations of spherical capacitors. A capacitor is one of the essential elements of the electrical circuit which can store and release electric charge. Capacitors are widely used in many electronic devices to perform a variety of tasks, such as smoothing, filtering, or bypassing an electrical signal. The construction of the capacitor is straightforward - they mostly consist of two separated plates. To determine the amount of electric charge that can be stored by a capacitor we use a quantity called capacitance. The more electric charge capacitor can hold, the higher is capacitance. To further improve capacitance we can fill the space between plates with some nonconducting dielectric medium. b is the radius of the outer sphere. The relative permittivity εk is a constant characteristic for a specific dielectric placed between the plates of the capacitor. In our spherical capacitor calculator, we assumed for simplicity that there is a vacuum between plates and therefore εk = 1. If you want to change material located between plates, go to the advanced mode. Spherical capacitors can be combined in parallel and series, too! Imagine that our capacitor consists of three concentric spheres where spaces between them are filled with different dielectrics. We can treat those spaces like separate capacitors combined in series, and the total capacitance can be calculated in the same way as parallel resistors. Now imagine that our capacitor consist of two concentric spheres but the space between them is divided into two halves, in which the space between shells is filled with different dielectrics. We can treat both halves as separate capacitors combined in parallel, and the total capacitance can be calculated in the same way as resistors in series. Spherical Capacitor Calculator can be embedded on your website to enrich the content you wrote and make it easier for your visitors to understand your message.